The outstanding caliber of the submissions for the 2014 Harry Levin Prize for the best first book published in the field of comparative literature between 2011 and 2013 impressed each and all of us on the 2014 Levin Prize Committee. The diversity of comparative topics and the scholarly and intellectual excellence of the submissions made our task more difficult than we might have expected. It also made our task enjoyable and rewarding; we read many fine books. We have chosen to award the 2014 Levin Prize to two strikingly different but equally exceptional books. Each in its own way illustrates the rich diversity of contemporary scholarship in comparative literature as each engages in simultaneously meticulous and bold comparative work. Sunil M. Agnani’s Hating Empire Properly: The Two Indies and the Limits of Enlightenment Anticolonialism (Fordham University Press, 2013) is an astute and learned inquiry into the Enlightenment, colonialism, and revolution in the anticolonial writings of Denis Diderot and Edmund Burke. Agnani’s nuanced analyses of Diderot and Burke and “the two Indies” demonstrate the suggestive power of ‘hating properly,’ of “entering into its [empire’s] terms and allowing the internal contradictions to be heightened rather than covered by a politic veil” (186). 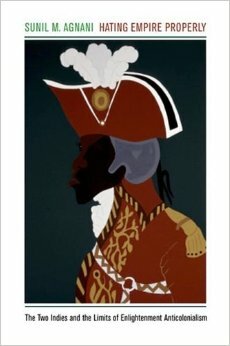 With rich textual analyses and theoretical agility, Hating Empire Properly more than substantiates its concluding suggestion “that the full ‘meaning’ and significance of the fragmentary discourses of the Enlightenment are manifest only in the colonies, rendered legible only by means of the colonies . . .” (190). 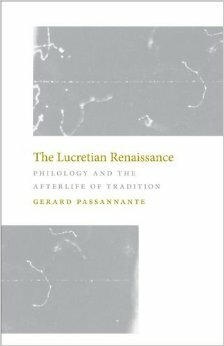 commentary, Passanante’s The Lucretian Renaissance is a compelling reformulation of “influence” and of philology. And it redefines and rewrites the literary history of materialism, richly fulfilling its effort to demonstrate that “a sustained literary engagement with materialism long preceded its late revival in the seventeenth century and was, in many ways, its very condition” (197).